My day job has kept me too busy to make many kayaking trips this summer. When that happens I try to spend my weekends exploring local waters. 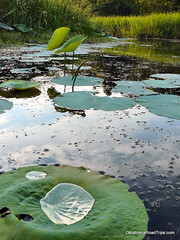 This weekend, Dianne and I took the kayaks to New Beggs Lake for some flatwater 'lily paddling'. The New Beggs Lake offers quick access and quiet paddling due to only aloowing fishing from non-motorized watercraft. If you enjoy fishing from your canoe, kayak or float tube, you may want to give New Beggs Lake a try. We saw quite a bit of fish activity on this lake and the water looks quite clear in the deeper portions of the lake. More pictures and details from our Oklahoma Road trip to New Beggs Lake. Thanks for the great advice I do not have much time either since i work in a drug rehab facility and when i do get time off i love the peace and quite.